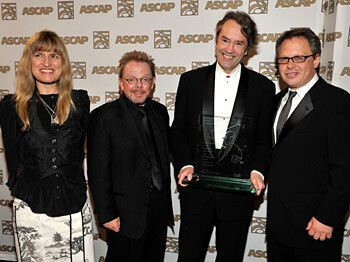 BEVERLY HILLS, Calif.—Carter Burwell was presented with the Henry Mancini Award, the highest honor for a film composer from the American Society of Composers, Authors and Publishers, at ASCAP's annual Film & Television Music Awards dinner Monday night, May 11, at the Beverly Hilton Hotel. Burwell, New York-based composer of Twilight, Being John Malkovich and 14 Coen Brothers movies including Fargo, The Big Lebowski and No Country for Old Men, was honored "in recognition of his outstanding achievements and contributions to the music of film and television," ASCAP president and board chairman Paul Williams announced. "Carter Burwell can do it all, and he has," Williams said. Twilight director Catherine Hardwicke praised Burwell's "complex and beautiful" score for the popular teen vampire movie. She said she was hoping for an "intimate and very personal" piece of music to become "Bella's Lullaby" – a famous element of the Stephenie Meyer novel. She got it when Burwell took a piece of music he had long ago written for his then-girlfriend (and now wife) Christine, and turned it into the piano motif that became so sought-after that it's now a hit in sheet-music form. Joel and Ethan Coen sent a video that appeared to be an amateurishly shot camcorder interview about their longtime collaborator on such films as Blood Simple, Raising Arizona, The Hudsucker Proxy and Burn After Reading. It was probably a gag, but their remarks were so difficult to understand that the joke was lost on the audience. At one point they quipped that Burwell "sends an accordion sketch to some guy in Sweden who writes it all down" for him. Later they added, similarly tongue-in-cheek, "we didn't realize they gave the Mancini to amateur musicians." Director Bill Condon, who collaborated with Burwell on Gods and Monsters and Kinsey, said "Carter makes us feel but he also helps us to think– [He writes] music that captures the ache of the human soul.... Subtlety, range, eclecticism, genius – they all define Carter's work." A seven-minute video showcased many of Burwell's film hits and included scenes from his upcoming Where the Wild Things Are. Also sending video greetings were directors Spike Jonze (Adaptation, Being John Malkovich) and John Lee Hancock (The Rookie, The Alamo). Most of the winners in the "top box office" category – among them John Debney (The Mummy: Tomb of the Dragon Emperor), Michael Giacchino (Cloverfield), James Horner (The Spiderwick Chronicles), James Newton Howard (The Happening, The Dark Knight), Hans Zimmer (Dark Knight, Kung Fu Panda, Madagascar: Escape 2 Africa), John Powell (Bolt, Horton Hears a Who, Hancock, Jumper, Kung Fu Panda), Brian Tyler (Eagle Eye) and others – did not attend. Many of the television winners, however, were there, including Sean Callery (Medium, Bones), David Carbonara (Mad Men), Jeff Cardoni (CSI: Miami), Reinhold Heil and Johnny Klimek (Without a Trace), John Keane (CSI), David Vanacore (Survivor, The Apprentice), Brian Lapin (Gossip Girl), Michael Levine (Cold Case), Bear McCreary (Eureka) and Trevor Morris (The Tudors).